Gear Up's Two Bike Vertical Storage does exactly what it says and does it very well too at a reasonable asking price. You can use it in the house or, so long as you've installed a gamekeeper type wall-anchor for security purposes, it's also great for garages and similar brick outbuildings. That said; the freestanding/pressure-fit beam type of bike stores, like the Revolution Floor to Ceiling Bike Stand might be better for rented properties since some landlords take exception to walls being drilled. What we have here is a sturdy MIG welded twin hook design complete with wheel guides that hold bikes securely and out of scratching distance. A removable wire mesh basket gobbles lids, gloves, pumps and other accessories that otherwise might go untamed and lead to domestic clutter and strife. Build quality is generally very good - the welding's a little workmanlike in places but easily up to the 100lb payload. Powder coating is also better than I've come to expect from mass produced units too, although our test sample had a superficial chip-easily retouched using hobby enamels but the zinc chromate primer should prevent the mild steel succumbing to the amber mould in any case. Installation is pretty straightforward unless you happen to be cycling's answer to Frank Spencer-you'll want a set of rawl plugs and an indelible marker handy though since these aren't included in the pack. Make sure there's no pipe work or electrical trunking lurking behind your chosen spot before whipping the pen from behind your ear and marking its intended destination. Start humming subversive Specials' classics; check everything's aligned with a spirit level and drill away. In practice, the OEM screws adhere well to heavy-duty plasterboard but I'd be inclined to go aftermarket for heavier duty brick screws rather than risk potentially expensive damage and tears before bedtime should one fail and a prized Colnago clatter to the floor. The plastic coated hooks are a marked improvement over the ubiquitous DIY sort and the wheel guides keep bikes from colliding (especially if you mount them top n' tail) supporting most sizes of road and mountain bike tyre securely although those beyond 1.95 can prove a tight squeeze. Cheap but genuinely cheerful storage solution but use rawl plugs and aftermarket screws. 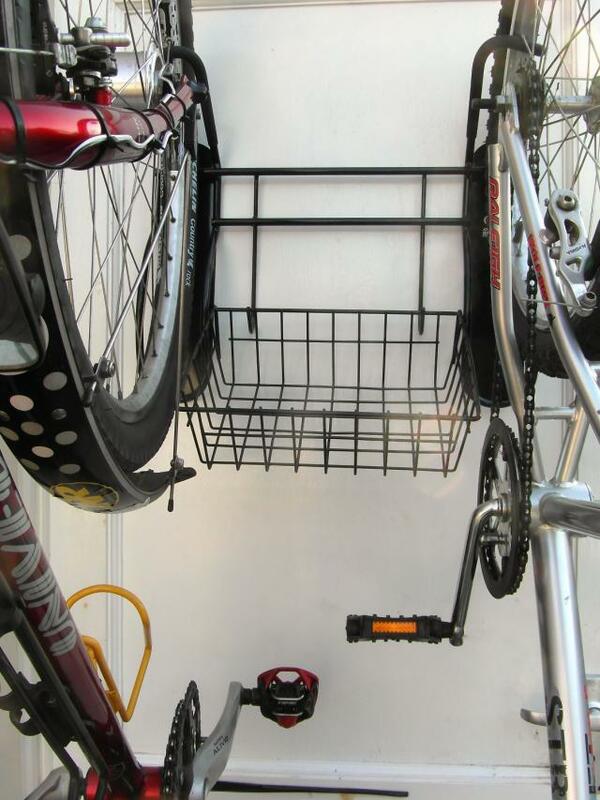 "The Off-the-Wall 2 - Bike Vertical Rack holds 2 Bikes plus helmets and much more. Foam covered arms gently cradle the bicycle tires and wheels vertically. A large removable basket compliments this rack and will accommodate a variety of accessories as well. Heavy duty mounting hardware is included and a powder coated black finish helps the rack resist scratches. 100 lb capacity. Installed dimensions 16" high, 19" wide, and 9" deep". Does exactly what it says on the tin, although I'm inclined toward rawl plugs and aftermarket screws for brick/solid walls. Mild Steel, MIG welded Construction with tough powder coated paint, 100lb capacity. Thick rubberised hook sleeves protect frame/component liveries while wheel guides and handy mesh storage basket prevent bikes making unwanted contact. Gear Up off the wall is an effective solution for keeping two bikes and everyday kit out of harm's way. Simple to install and kind to paintwork, I'm not sure I'd want to leave expensive bikes hanging by the OEM mounting hardware. Nicely made for the money. Only let down by the OEM mounting hardware. "That said; the freestanding/pressure-fit beam type of bike stores might be better for rented properties since some landlords take exception to walls being drilled."